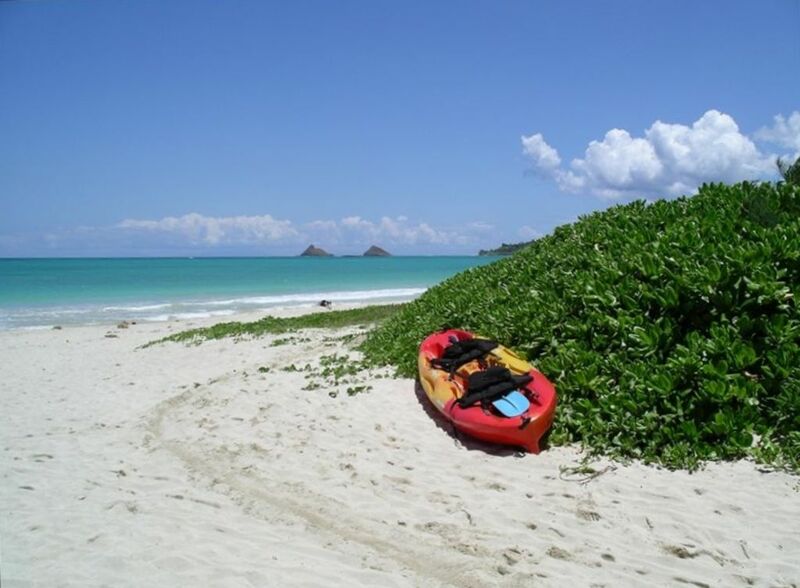 Located less than 100 yards down a sandy path (no shoes required) to world-class Kailua Beach. Enjoy beautiful sunrises and the soothing sounds of the ocean. With over 3000 sq ft - so you can gather together or retreat to your own private place. Less than 100 yards to beach. Partial ocean view from upstairs. Inside dining table seats 8 Outside BBQ area has 2 large tables, loveseats, small table, wicker set. Comfortable, roomy, great location. Robyn was very kind and laid-back and lives just next door. We are 9 friends, plenty of room to gather or find a quiet corner. Kitchen very nice and bright, well-stocked which was very welcome because we have some great cooks in the bunch. Nice grill with lots of propane too. Only downside was the parking space was tight for 3 cars, two is better. Would highly recommend. Our family loved our stay. We especially enjoyed being so close to the beach—gorgeous. Wonderful location on one of the world’s most beautiful beaches. The house is refreshingly low-key and comfortable, as is the neighborhood. Robyn, the hostess, is an angel - super helpful when needed. Paradise! Finding a house near a beautiful beach large enough to hold an extended family of eleven was tricky especially as I left the search a bit late. I was so pleased to finally lock in Pikake Hale next to Kailua Beach with the township about a five minutes drive away. If you read through the reviews for this home you will know all it has to offer and more, we were not let down. I must say that all communications with the owner Dave and the house manager Robyn were excellent and we felt valued and respected as guests. We all had a marvellous time and would recommend not only this home to stay in but the area of Kailua, so quiet and relaxing after busy visits to Waikiki and North Shore. I really want to give this home five stars however I feel that some improvements could be made to make it the awesome destination I believe it is. Along with my husband I stayed in the upstairs bedroom which was spacious and had a very comfortable bed. It was our wee escape from everyone else if we so choose to. We were disappointed that the venetian blinds couldn't be pulled up to enjoy the views and they were almost impossible to open and close due to broken cords. We could however go onto the patio/lanai alongside the room to take in the view so didn't feel too let down. Lets go with four and 1/2 stars! Fabulous property - loved every bit of it. Best beach ever right outside . Everything was great. The location is literally steps from the beach. Easy to access restaurants, shopping etc. The house was spotlessly clean and a nice gift basket greeted us. The layout has wonderful gathering areas yet nicely separated sleeping areas. Nice items for the beach are available such as beach chaired, boards, and snorkel gear. Robyn was very helpful with any questions we had. We would love to go back. The house was great, large, roomy, perfect for a family getaway. We had 11 family members from age 1 to 69. The kitchen was well stocked, plenty of dishes, utensils, pans, etc. We ate most meals at the house, there is a large table inside, an even larger table on the patio, inside and outside refrigerator, and it is completely fenced for privacy and to keep little ones from wandering off. The bedroom layout is great, an upstairs master, a downstairs master, a kid's room, and 2 other bedrooms, The 4 bathrooms were great, every bath had shower and/or tub. The washer and dryer were nice, we could pack light, laundry soap and dryer sheets were included. There were plenty of boogie boards, beach chairs, an umbrella, beach toys, etc. The beach was so close down the sandy path, not crowded at all. A great base for an Hawaiian adventure. Standard Rates are $600 low season & $720 summer based on 10 guests - maximum of 12 guests. Email or call for small group and other discounts. Cleaning fee is $550 30 Day rent blocks available. Prices are subject to change without notice.